Tired of playing in-flight origami when using one of the standard cross country / flight planning forms from the standard providers? Consider giving our Better Flight Planner a try. It's ergonomically correct-- laid out cleverly to be usable on a standard kneeboard--and informationally rich--providing a host of important features the others just don't. We think once you try our Better flight planner, you'll never go back to the standard ones... but don't take our word for it--give it a try yourself. It's FREE. You are welcome to print it out, make copies, and distribute it at your FBO or club. All that we ask is that you distribute it in unmodified form. And if somebody happens to ask you where you got it, we'd be most obliged if you could steer them to our website and our products. Have questions about these flight plan forms? - If you have questions about how to use this flight planner, we'd be very grateful if you could ask your question on an online or social media aviation forum that you might happen to frequent. This a win-win for all involved:	you'll likely get better and helpfully wide-ranging answers than our helpdesk staff might be able to offer, you'll likely start a discussion that you may find illuminating and helpful on other aviation matters, and, by including links back to this page or our website, you help spread the word about our free resource to other pilots who could benefit from it. FAA vs ICAO? 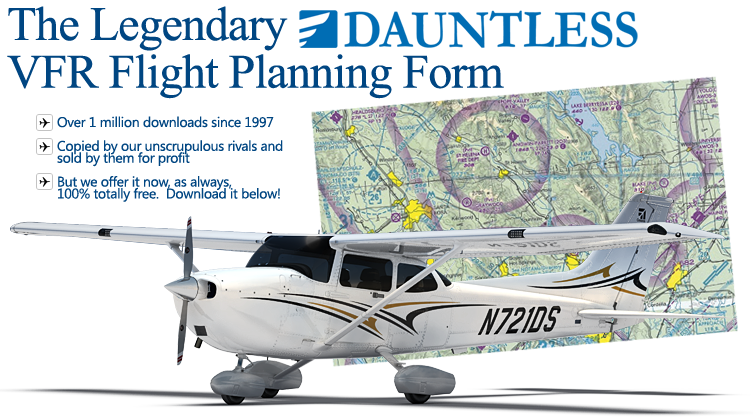 - Our VFR flight planning form is now available with both traditional FAA and ICAO flight plan filing subforms. As of this writing, pilots in the USA are still welcome to use the old/traditional FAA flight plan form but are increasingly encouraged to use the ICAO form. At some point in the future it is conceivable that the ICAO form will become standard in the USA as well. Angela Crossley's (UK) Auto-Calculating VFR Flight Planning Form - you will also find a good number of other neat aviation items of interest at the ActiveAE page. It is a form designed to be used by pilots generally flying VFR cross-country flights. Traditional VFR Flight planner forms have not been designed with the pilot in mind. Specifically, this form has been designed for use on kneeboards without the folding, flipping, and reclipping necessary of most standard 8.5" x 11" forms. True, some kneeboard-sized forms have been made, but these are generally skimpy on space/information. Print out the flight planner onto the front and back of a standard 8.5x11 sheet of paper. IMPORTANT: print it so that the arrows (in the black circles on the center crease on each side) are on the same side. Now, fold along the center crease such that the page with the large "notes" section in the center is the "cover" of your "book." Generally, when you clip this form into your kneeboard, you clip it such that only the inside face is clipped. 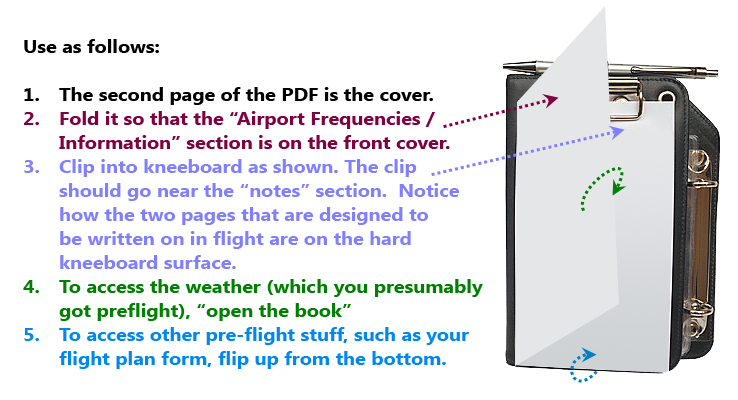 This allows it to swing open like a book as well, for you to have easy access to the writing surface with your waypoint information. There's a spot on one of the pages where you can, using your favorite paint program, insert a chart / sketch of your own area so that you can draw a weather depiction chart onto it. How did you make this form? This form was created in VISIO and then transformed into Adobe Acrobat (.PDF) format. Traffic Pattern Altitude. This abbreviation is found regularly in aviation including in several FAA publications, though it does not appear in the AIM. It does appear in the Chart Publications Aircraft Facility Directory. How can I get help with using this form? If you have questions about how to use this flight planner, we'd be very grateful if you coiuld ask your question on an online or social media aviation forum that you might happen to frequent. This a win-win for all involved:	you'll likely get better and helpfully wideranging answers than our helpdesk staff might be able to offer, you'll likely start a discussion that you may find illuminating and helpful on other aviation matters, and, by including links back to this page or our website, you help spread the word about our free resource to other pilots who could benefit from it. If you don't currently visit any such forums, you can try Dauntless Aviation's own Ask a CFI forum. My flight school? my FBO? my club? sure! go ahead. But just don't remove, alter, or obscure the copyright notices. Furthermore, you may modify the form--but only if you are the end-user of those modifications. That is, don't make modifications and then distribute it. This is not allowed. You may NOT sell this form or make money off of it in any other way without our permission, however. This includes - you may NOT include this form on a CD-ROM of shareware / freeware or charge money for printing for others, and so forth.